June's update brings you a few more of the B & G related items that have been sent in to us this year. As we said in our May update, there are so many that we have had to split them up and will post them on these pages with the next few updates. Our June 2012 update brings you some more of the copious B and G enquiries and observations we have already received this year. We seem to have accumulated a fair old backlog of B & G items over the last few months, so please bear with us if your enquiry, question or observation hasn't appeared here yet, it will do before too long. So please accept our apologies for the delay. The first item you see here is a picture owned by Jennifer Kirby which may or may not be one of the titles from the B & G wood inlay catalogue. Unfortunately there is no identifying BG logo to be seen. This does not however disqualify it from actually being a B & G piece, principally because they did actually produce some wood inlay pieces without the logo, but this wasn't very often. 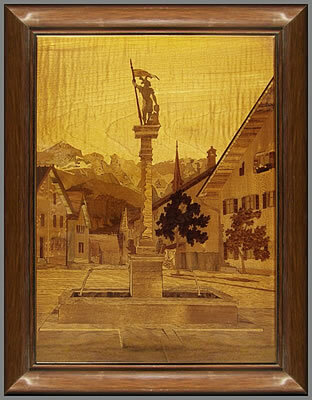 However, it is possible that the picture was instead produced by the ancient and much respected French wood inlay company of Spindler. If any of you have a copy of the picture yourself and you know the title and maker, could you help us old codgers out with the answer to this puzzling enigma, thanks. 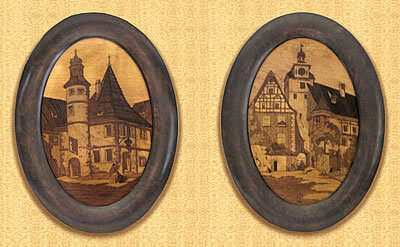 The second photo you see is of two oval marquetry / wood inlay pictures of German or French large houses. Again, these are pictures we don't recognise. They look to be well produced and made to a high standard, but, if any of you can help us out with more information, we would be very grateful to you. 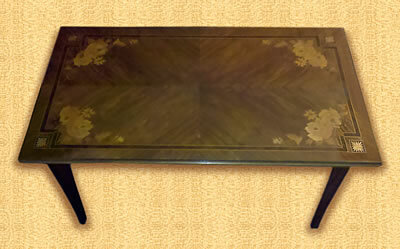 Our third item this month is a very desirable looking oblong coffee table which once again may or may not be a B & G piece of furniture. As with the other two items on display this month, there is no distinguishing BG logo 'signature' to be found on this table. If there was we could of course quite definitely state that it is a true Buchschmid and Gretaux Wood Inlay piece, but without that all important logo, we cannot say for sure. The style and appearance have many of the B & G features. 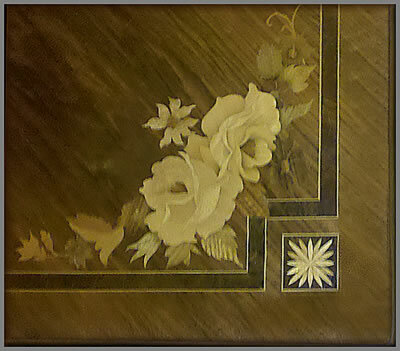 In fact the detail and quality of the Roses and other foliage are well up to the usual B & G standards, so if that alone were used as a yardstick to determine the maker or artist of the wood inlay (marquetry) we would probably say that there is a good 75 percent chance that B & G were involved somewhere along the line with the table's production. But this would still be an estimation until we could have some verifiable proof of the makers concerned. 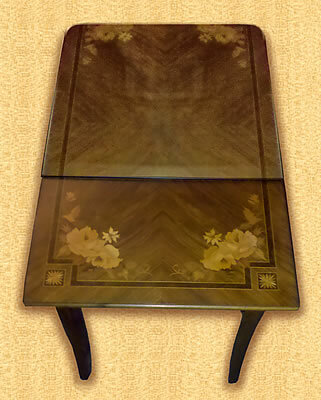 So, once again this month, if you have a similar table and can recognise the wood inlay style and work, would you please help us out and increase our knowledge of the world wide producers of such fine pieces of wood inlay and marquetry works. Thanks for your help. Click the above button to return to page 39 of "Can You Help"